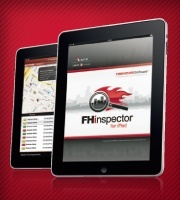 Firehouse launched this groundbreaking FH®Inspector iPad® application in 2010, and has dramatically updated and improved it thanks to direct input from experienced fire inspectors nationwide. FH®Inspector 3.0 flows through the entire inspection process, from scheduling to on-site walkthrough to synchronization back to FH, making the app a natural part of the entire inspection process. What is the App Store approval process? When updates for FHinspector for iPad are made available, the application must be reviewed and approved by Apple®before it will be posted to the App Store. To help FHinspector users understand the review process, we wanted to share the information we are provided by Apple’s App Review Board as guidelines for their approval. This information can also be found at https://developer.apple.com/appstore/guidelines.html, and can change without notification as the App Review board deems necessary. The app approval process is in place to ensure that applications are reliable, perform as expected, and are free of explicit and offensive material. We review every app on the App Store based on a set of technical, content, and design criteria. This review criteria is now available to you in the App Store Review Guidelines. These guidelines are designed to help you prepare your iOS and Mac OS X apps for the approval process. We’re pleased that you want to invest your talents and time to develop applications for iOS. It has been a rewarding experience – both professionally and financially – for tens of thousands of developers and we want to help you join this successful group. We have published our App Store Review Guidelines in the hope that they will help you steer clear of issues as you develop your app and speed you through the approval process when you submit it. We have over 350,000 apps in the App Store. We don’t need any more Fart apps. If your app doesn’t do something useful or provide some form of lasting entertainment, it may not be accepted. If your App looks like it was cobbled together in a few days, or you’re trying to get your first practice App into the store to impress your friends, please brace yourself for rejection. We have lots of serious developers who don’t want their quality Apps to be surrounded by amateur hour. If you attempt to cheat the system (for example, by trying to trick the review process, steal data from users, copy another developer’s work, or manipulate the ratings) your apps will be removed from the store and you will be expelled from the developer program. Lastly, we love this stuff too, and honor what you do. We’re really trying our best to create the best platform in the world for you to express your talents and make a living too. If it sounds like we’re control freaks, well, maybe it’s because we’re so committed to our users and making sure they have a quality experience with our products. Just like almost all of you are too.